For all of humanity’s achievements, one of the most important is how we communicate and pass down knowledge. From clay tablets to hard drives, long-term data storage ensures the flow of information from generation to generation. Now, a new data format could preserve that information for a virtually unlimited amount of time by encoding it into glass discs about the size of a coin. The idea for this method, known as “five-dimensional storage,” has floated around for a few years since scientists at the United Kingdom’s University of Southampton first demonstrated it in a 2013 paper. Back then, they were only able to code a single 300 kilobyte text file into a glass disc. Three years later, the same scientists say that they believe they have refined the technique to the point where they can code about 360 terabytes of data onto a single disc. What’s more, at room temperature the discs have a nearly unlimited lifespan. At high temperatures, 374 degrees Fahrenheit to be exact, the disc’s creators estimate the lifespan to be 13.8 billion years—about as long as the universe has existed, Doug Bolton writes for The Independent. As a very stable and safe form of portable memory, the technology could be highly useful for organizations with big archives, such as national archives, museums and libraries, to preserve their information and records. 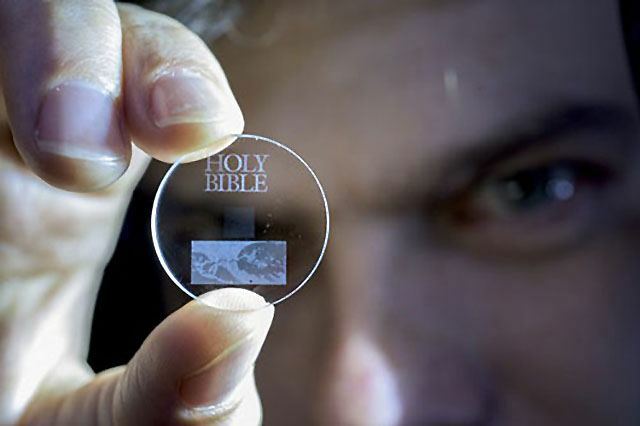 Here’s how it works: using a femtosecond laser, the scientists engrave the data into the glass disc’s structure. By firing intense laser pulses a quadrillionth of a second long, the information is carved into a series of miniscule dots. When the disc is read later, a laser interprets the information based off of the three-dimensional position of the dot in the disc, as well as its size and orientation—hence the name five-dimensional storage. In some ways, it’s similar to how data is encoded onto CDs, except in this case the information is stored directly in the disc’s structure instead of on its surface, Vincent writes. That’s why five-dimensional data discs can store information much more densely than on CDs. Glass is also much stronger and more chemically stable than the polycarbonate plastic most CDs and DVDs are made of, which is why the scientists believe they could potentially last for such a long time. 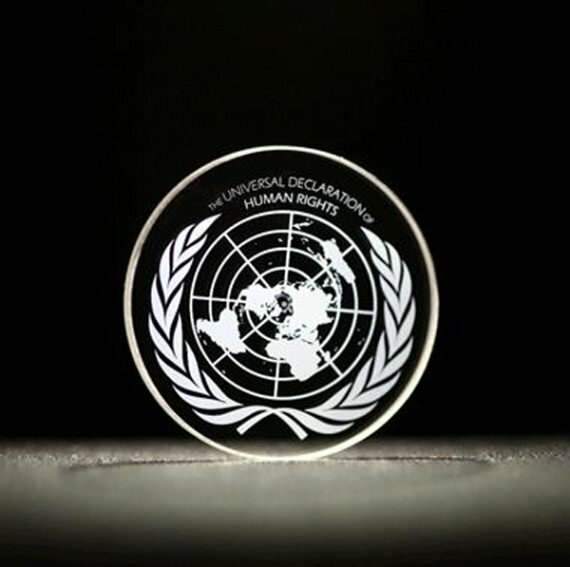 As a demonstration, Kazansky and his colleagues have encoded several major works onto glass discs, including the United Nations’ Universal Declaration of Human Rights, the Magna Carta, the King James Bible and Isaac Newton’s Opticks, Jamie Condliffe reports for Gizmodo. But while the researchers are optimistic about the possibilities for five-dimensional storage, the average person won’t be replacing their hard drives for glass discs any time soon. Not only is it hard to get consumers to switch over to a new data format, but femtosecond lasers are expensive and delicate tools that probably won’t become common outside of the lab for a while. On the other hand, developing a device to read the discs wouldn’t be too hard, which might make the discs more useful for institutions like libraries and museums, David Nield writes for ScienceAlert.